I made a few mistakes here. At first I included my rug but then my sketch included only the floor. 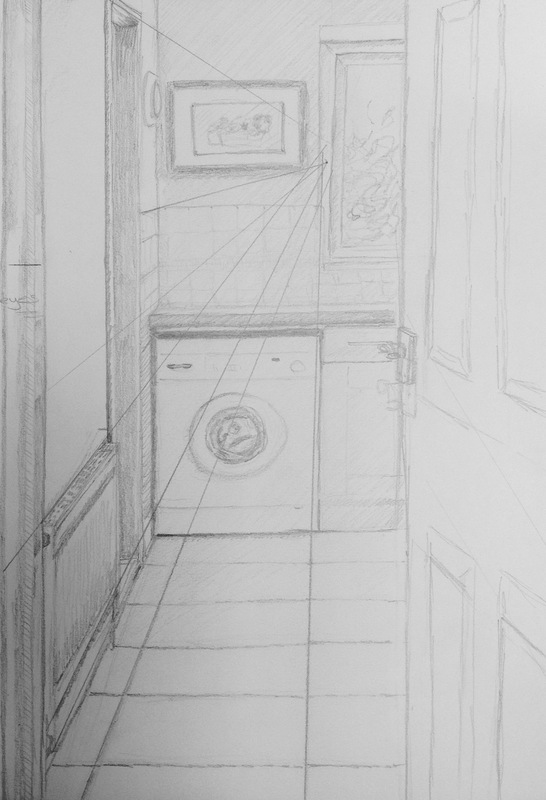 So I started again fixing my eye-level first and drawing the washing machine from this. This helped me compose my drawing but unfortunately the bottom of the doorframe and also the mat where cropped out. However,I decided to carry on, holding up a pencil and squinting my eyes to see the lines of perspective. From these I established what I think was my vanishing point and this helped me check my other lines of perspective. The open door does not seem to follow these rules as it is open half way across the door. The vanishing point did not seem to line up with my eye level, so I need to work on this next time. Next Article Project 4 Exercise 2 : Angular perspective.